I’m happy to announce my first giveaway to go along with this recipe. First we’ll talk about the recipe then the giveaway. Chorizo, when Europeans hear this word they think of a fermented cured red sausage. But when North Americans hear chorizo they think of a crumbly meat red sausage. Spanish chorizo and Mexican chorizo are very different from each other in looks, texture and taste. And no matter what you may find on the Internet the two are not interchangeable. I love both types of chorizo but for very different reasons and to enjoy in different ways. Today I want to share my recipe for home made Mexican chorizo that you can use in any of your favorite Mexican recipes. I will share some ways to use this chorizo in the coming weeks as I use it up, so stay tuned. 1. 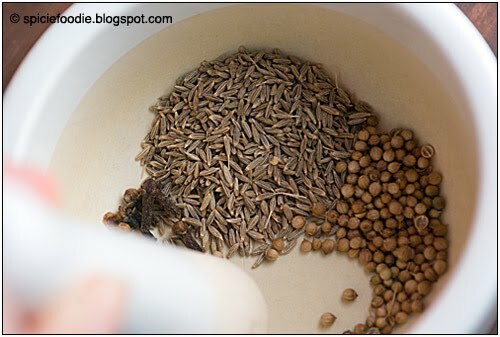 In a mortar and pestle grind the cumin seed, coriander seed and cloves. 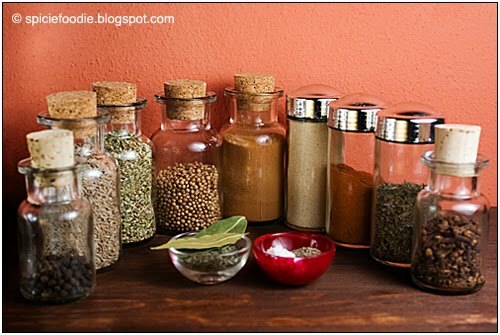 Break up the bay leaves with your hands as much as possible and add them to the spices in mortar and pestle, grind until you have a fine powder. Next add the remaining spices to the mortar and pestle and grind/ mix until everything is well combined. 2. In a large glass bowl using your hands break up the the ground pork . Next you may want to put on some plastic gloves to prevent burning and staining to your hands. Pour in the vinegar and half the spices, spread them evenly on the pork, and start working it into the ground pork. Adding more of the spice mixture until it has all been used up. Keep working the meat until it turns red (from the chili) and all the spices have been well combined. It’s best to let the chorizo sit overnight before using it because this will allow all of the flavors to come together and make for a better tasting chorizo. Alternatively you can freeze the chorizo until you are ready to use it. 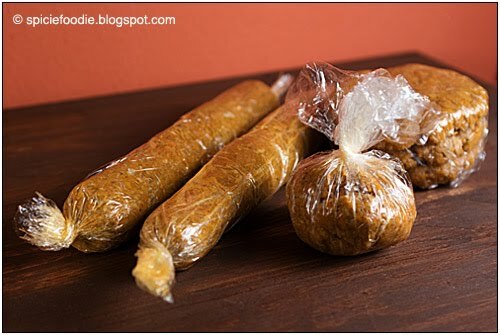 Since this chorizo doesn’t have casings you can form or shape sausages or patties and keeping their form by wrapping them in plastic kitchen wrap. Another way to store the chorizo in the freezer is by portioning out amounts and storing it inside plastic bags to put in the freezer. This way you defrost what you need or want without having to use the whole large batch. Now you are ready to use the chorizo in all of your favorite Mexican recipes like these potato and chorizo tacos, or sopes, frijoles charros, chiles rellenos or any of your other favorite fusion recipes. Authentic Homemade Mexican Chorizo Recipe. Make your own chorizo easy and quickly too! Perfect for adding to tacos, burritos, eggs, and all of your favorite Mexican dishes. 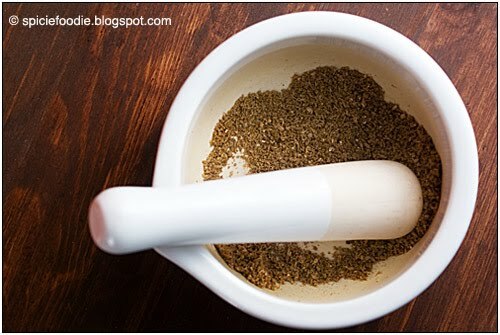 In a mortar and pestle grind the cumin seed, coriander seed and cloves. 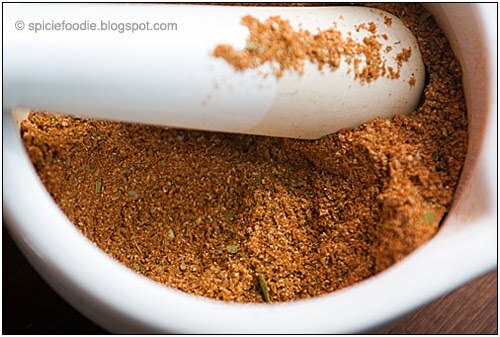 Break up the bay leaves with your hands as much as possible and add them to the spices in mortar and pestle, grind until you have a fine powder. Next add the remaining spices to the mortar and pestle and grind/mix until everything is well combined. 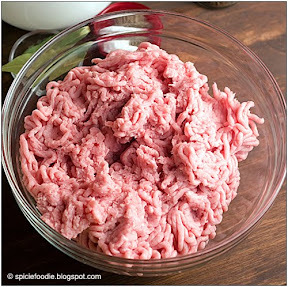 In a large glass bowl using your hands break up the the ground pork . Next you may want to put on some plastic gloves to prevent burning and staining to your hands. Pour in the vinegar and half the spices, spread them evenly on the pork, and start working it into the ground pork. Adding more of the spice mixture until it has all been used up. Keep working the meat until it turns red (from the chile) and all the spices have been well combined into the meat. It is best to let the chorizo sit overnight before cooking with it. This will allow all of the flavors to come together and make for a better tasting chorizo. Alternatively you can freeze the chorizo until you are ready to use it. 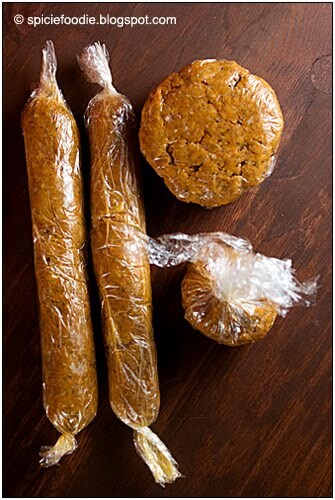 Since this chorizo does not have casings you can form or shape sausages or patties and keep their form by wrapping them in plastic kitchen wrap. Another way to store the chorizo in the freezer is by portioning out amounts and storing it inside plastic bags. This way you defrost what you need or want without having to use the whole large batch. *Handling chili powders can cause burning to your hands. I highly advice to use plastic gloves for handling the chili and chorizo. Love the Mortar and pestle giveaways. PS: I am Following you. Hi. Nice recipe and cool gift. There is the link for the post I made. This is awesome! I often make a frittata using chorizo, spaghetti and various vegtables…I do not need that casings as I usually dig the sausage out for this recipe anyway. Making up the chorizo you have here would work perfectly. I also could hold back a bit of the spice to add directly to the egg as the reason I use chorizo in the first place is because some of the paprika, etc 'leaks' out into the egg. can't wait to try this. ps: I follow you already on Foodbuzz and Facebook. Love the give away and the recipe looks devine. Following you! Thanks so much for this recipe! I love chorizo, but would like to make my own on the leaner side. I'd love to win that mortar and pestle. What a beautiful post! love the photos and the overall color pallet is rich! I added this link on my facebook page for the giveaway. Please enter me for the beautiful red mortar/pestle. Thanks! I am following you on google friend connect. I am following you on twitter. Thanks! Beautiful! I'd love to win it. Thanks for offering it. What a cool giveaway! Love all those seasonings too! just this past weekend i was asking friends what qualifies sausage as chorizo. perfect timing! I have never made chorizo before. You make it seem so easy! I am following you google foods and am throwing my comment in the ring for the mortar and pestle. I love these they're always needed in Indian cooking. I love chorizo – thanks for posting! Looks really great! And great giveway! That mexican chorizo looks soooooooo good. Can't wait to try it out! Please enter me for the contest! What a lovely blog, post, and giveaway!! My girlfriend loves chorizo; she would be so impressed if i were to make a homemade version for her. Thanks for sharing a great recipe! 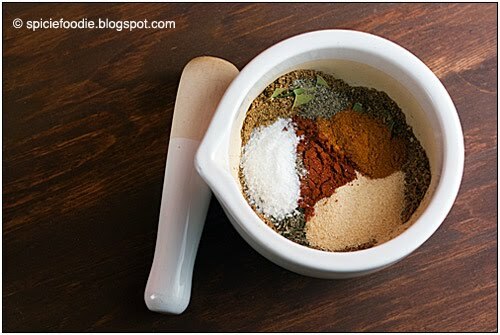 I love the red color of the mortar & pestle! It would match my daughter's kitchen, and I know she'd love it. I've been talking about making my own chorizo for a long time–thanks for the recipe! P.S. Friended you on FB! A homemade chorizo sounds terrific! My 5 year old recently discovered that she loves chorizo and would be thrilled to help me make it from scratch! Very cool! we love this giveaway, so many awesome recipes to use with this great sausage yum! ooh i need this!Red is the accent colour n our house once the renovations are done,kitchen is going in as we speak!3 weeeks of frozen food nd eatng out..yuck!I want my kitchen and real food! I would love to be entered in your draw. Thank you very much! great giveaway and wonderful recipe! 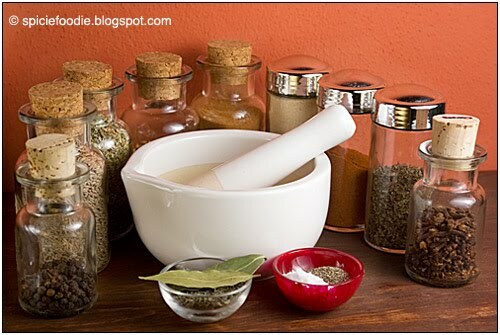 Thanks for opportunity to enter the giveaway… I would love a LC mortar and pestle in my aresenal. didn't realize i didnt post it. I will certainly try it at home. I love chorizo so so so much. If chorizo is a man I probably will married to him million times lol. Do you think this recipe could be made with ground beef? I don’t eat pork but I wonder if beef would need a different spice blend. Yes, you could really make it with any type of ground meat of your choice. The taste of course will vary greatly. Also leaner meats will need either extra fat added or they chorizo will be drier. Enjoy the chorizo!